Today’s sports broadcasts require wireless microphones that deliver an immersive experience for the home viewer while providing security and fidelity for the audio recordist. That’s why today, Zaxcom, a leader in innovative audio technology, is pleased to announce the ZMT3-Flex, a wireless transmitter created to capture the on the field experience of professional sports. Inspired by a creative collaboration with top audio specialists, the ZMT3-Flex is part of Zaxcom’s patented Digital Recording Wireless line that can transmit a fully encrypted digital audio signal while simultaneously recording the audio internally. The ZMT3-Flex is constructed from a soft yet durable silicon rubber that allows the transmitter to bend and flex, providing an elevated level of safety for the professional sports player. The design also features rounded corners and is extremely thin at only 0.4 inches (1.02 cm). It weighs only 3 oz (85 g). The unit is versatile, capable of transmitting audio from a single mono microphone or dual microphones in stereo through two microdot inputs. The internal recording simultaneously provides a catalog of all audio whether transmitted or not to a microSD card with timecode. The audio is recorded to a highly reliable lossless format called MARF that eliminates file corruption due to a dead battery or early card removal. When transmission security is of the utmost importance audio can be encrypted using one of the 16 million encryption codes for an unbreachable level of privacy. ZaxNet™ functionally is included which allows you to control the ZMT3-Flex remotely without removing the bodypack from the talent. Sound recordists can select a channel, adjust the input gain, jam timecode or place the unit in record and playback modes. 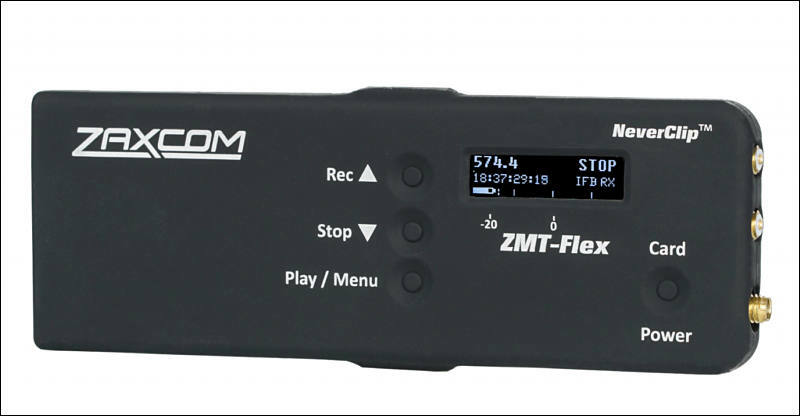 The ZMT3-Flex is also equipped with Zaxcom High Density modulation or ZHD for short. ZHD increases the number of available channels at a location. This is especially important in places where there are a number of nearby wireless systems. An integrated OLED is paired with manual controls to navigate an intuitive menu system. Powering the unit is a single rechargeable battery. The ZMT3-Flex is shipping now with a MSRP of $2,495.